I always struggle with the fact I have a corner front door which and one-sided side light (Oh how I envy those beautiful large symmetric front porches!) But I try to make do. I HAD to reuse my wood slice stag’s head. I just love it so much. I couldn’t find a place for it inside the house this year, so I used it outside. To echo the browns in the deer head, I filled a bucket with pine cones and some of my beloved cedar fronds. I found these old sleigh bells on clearance after Christmas a few years ago and never knew where to use them. They are really heavy and loud. To raise the level of display I used an old crate. The red lanterns are fro Ikea and the sleigh is thrift store find. I couldn’t figure out what to put in side, but I had this log left over from when I was working on my wood slice chalkboard banner and so I threw that in. I got this pine cone and berry garland at Michaels on Black Friday. 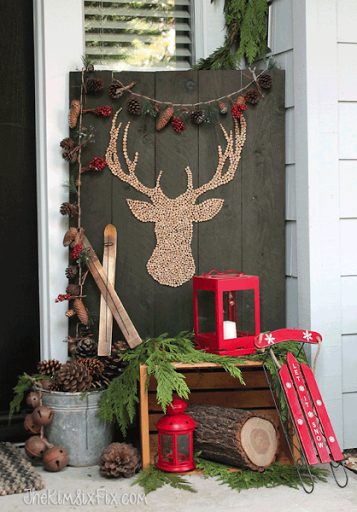 I originally thought I would weave it through a pine garland, but once I swaged it on the deer art, I like it as is. I actually had two, so the other one I wrapped into a fresh pine wreath (I also picked up on black friday) to tie it all together. 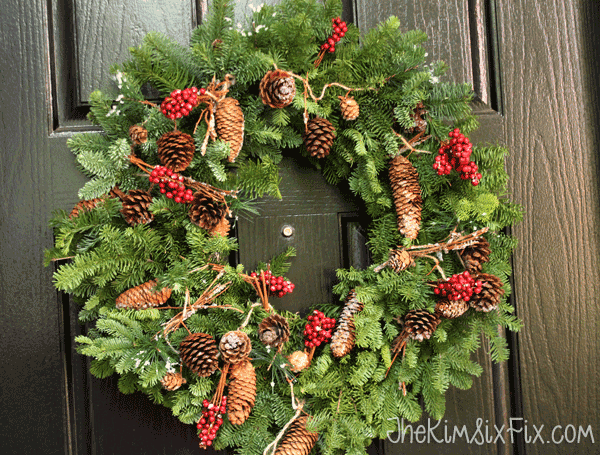 I'm glad I used a real wreath on the door since I used a fake one on the front of the house and side by side with the cedar it looks REALLY fake. Because I didn’t use any lights this year (I normally put lights in all my garlands) I wanted to add some sparkle to the display, so I wove fairy lights (battery operated) though the bucket of pine cones and in and out of the crate. I also added a large NOEL marquis light I picked up last year. It is pretty bright and throws enough light on the front porch when it is plugged in. Finally, on the front of the house, I added more cedar garland, sagging it across my garage door opening. Right now there is NO POSSIBLE WAY I could park my van in the garage, so I let the swags hang pretty low. Normally this would hit the top of my car, but my garage is so far from being clean I figured I wouldn’t worry about it. It will be a miracle if my van needs the garage! I hope you come back later in the week when I share the interior of the house. It isn’t all as rustic as this.. in fact, there is quite a bit of glitter involved!